I was inspired to create this bottle when my own baby was diagnosed with a birth defect. Because of information and statistics given to me by my doctor, we had reason to believe the birth defect was environmentally caused. After thorough research on the devastating effects of BPA and phthalates (the hormone disrupting chemicals that leach from plastics into our foods), I knew I had to act – and the 5 Phases Glass Baby Bottles were born. Experts agree that glass bottles are the best solution, but we needed to make them safe, convenient & unbreakable. My passion in creating this bottle has been to both educate and help caring parents, while giving them a better alternative. 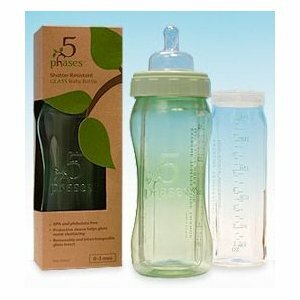 5 Phases baby bottles have a removable glass insert protected by an outer plastic shell that is BPA and phthalate-free. The outer shell protects the bottle from breakage, and certainly seems more sturdy than just a silicone sleeve found on other glass baby bottles. They are dishwasher safe. Would I buy this product? Maybe. $19.99 is a lot for a baby bottle, but if you are worried about glass breaking, this is the most protective glass baby bottle I have seen. This was not a huge concern for me, as I didn’t have much of a need for baby bottles. If you only need one bottle, like I did for water and occasional pumping, then the price is not prohibitive. On one of my early reviews of Klean Kanteen, I remember a commenter warning me about putting tea in these stainless steel bottles for my kids. Obviously, I didn’t put boiling water in and then hand it to my child, but stainless steel does transfer heat and cold quickly. The solution: the Klean Kanteen insulated wide mouth bottle, which is now available in colors! I use an insulated Klean Kanteen as my coffee cup, but the wide mouth is also perfect for packing soups in your child’s lunch. Icy drinks stay cold for up to 24 hours, whereas warm beverages stay hot for six hours in this stainless steel bottle. I can vouch personally for both. In fact, I would extend the timeline. I have returned from four days of backpacking to refreshing cold water in my car left in an insulated Klean Kanteen. Another superior feature of Klean Kanteen over other stainless steel bottles is the lid. It may be a small detail, but it is an important one. 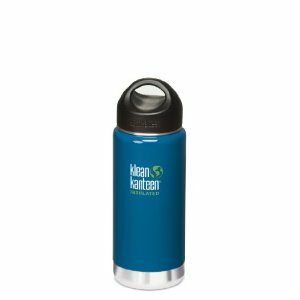 The Klean Kanteen lid goes over the lip and covers the point of contact when drinking. This keeps the germs away when the bottle is tossed into a backpack, falls on the floor, or rolls around in the car. Would I buy this product? Absolutely YES! I just have to trust the “responsibly made in China” statement on the bottom. 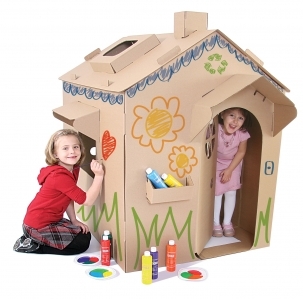 Lightweight, strong and mobile, this corrugated cardboard playhouse will win over the hearts of your children, who will use their creativity to decorate it to their own taste, with crayons, paint, paper and other materials. My ten-year-old and seven-year-old figured out how to assemble this cardboard house all by themselves. It is large enough for them both to fit inside, as well as the dog. Their imagination was sparked and dramatic play ensued as soon as it was assembled! Coupled with the refrigerator box they had also just acquired, there has been hours and hours of serious cardboard play on our back deck. It’s been two weeks, and my children have not tired of this cardboard playhouse (neither has the dog). They have yet to even decorate it! Would I buy this product? Maybe. $48 is a lot of money for a cardboard box, but how often do you actually buy a new appliance with a large box that will inspire such play. It’s cheaper than buying a wooden playhouse, which we have, and will get just as much use. The great thing is that once your children outgrow the cardboard playhouse or tire of it, you can recycle it if it is no longer worthy of passing on. B. Toys has sent us products before, and I felt the company’s eco-friendly promotion was borderline greenwashing. I am pleased to say the company has improved with this toy, and I love the Zany Zoo Wooden Activity Cube we were sent. 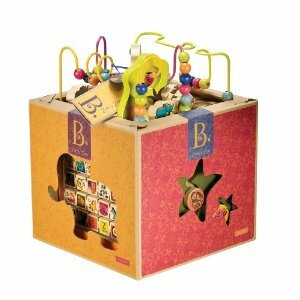 All B. toys are eco-friendly; the packages are recycled, recyclable, some toys come in reusable bags made from recycled PP plastic, and others come in boxes that reverse to become automatic gift-wrap! B. toys are beautiful, fun, interactive, unique, eco-friendly and affordable and they give back to children all over the world with our cause marketing partnership with Free The Children. The lead toy designer, Gisela Voss, is from Peru. She has integrated some incredible color palates and designs in all of the toys! I don’t know the source of the wood for this great activity cube, and the packaging is plastic free (all recyclable cardboard). I also don’t know the content of the paint, and there is a slight odor upon opening for the first time. I find the activities on this cube great, much better than the one I purchased at Costco when my kids were little. I think every toddler should have a wooden activity cube! Would I buy this product? Probably not. $100 is a lot of money, and for that price I would want assurances as to the wood truly being ethically sourced, vegetable dye based paints, and cardboard that is already made from post-consumer cardboard. If it was cheaper, I probably would buy it, as the one I had for my kids certainly didn’t meet the eco-friendly standards just described. This toy is made in China. We’ve reviewed Anni Daulter’s Ice Pop Joy cookbook in the past. 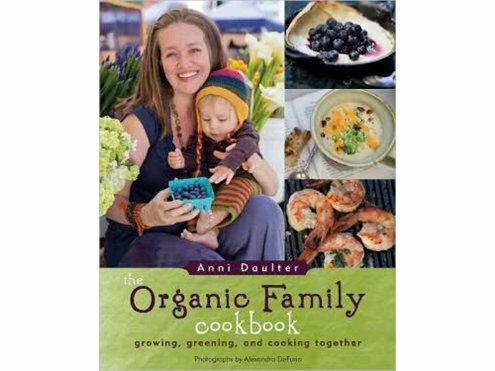 Now we are pleased to share the The Organic Family Cookbook: growing, greening, and cooking together by Ms. Daulter. I consider my family an “organic family”, as 90% of the food we eat and the products we consume are grown organically. Furthermore, we have a large organic garden and preserve a lot of food for the winter months. Thus, I was curious about this cookbook. This inspiring cookbook answers the call for healthy recipes for family-friendly organic meals — snacks, breakfasts, lunches, dinners, desserts, and extras. Sidebars and tips throughout promote green living — organic child- and family-specific gardening ideas and inspiration for community building and sustainable living. Recipes use easily obtainable ingredients from standard grocers, green markets, or the small family garden plot. Recipes are both wholesome and kid- and family-tested approved! Bonus recipes for favorite, everyday basics and delicious, seasonal treats. Tips and anecdotes throughout the book offer simple gardening, green living, and community-building ideas. This cookbook has beautiful photographs to inspire you to make the delicious recipes. Interspersed with the recipes are tidbits about green family life like school gardens, eco-friendly parties, and herbal tea stands. The roasted tomato garden tacos are making my stomach rumble!